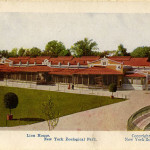 So proclaimed a 1906 New York Tribune feature on the artists who studied their subjects at the New York Zoological Park, or Bronx Zoo, as it became more commonly known. To be sure, any work involving wild animals can be dangerous. Yet while Bronx Zoo officials could never guarantee the behavior of the animals in their charge, they set a new precedent for accommodating and encouraging artists working at the Zoo. Most prominently, this accommodation took the form of a workspace dedicated for artists’ use in the original construction of the Lion House. Debuting on July 9, 1903, five months after the Lion House’s opening, the artists’ studio realized a vision that dated nearly to the beginning of the Wildlife Conservation Society. 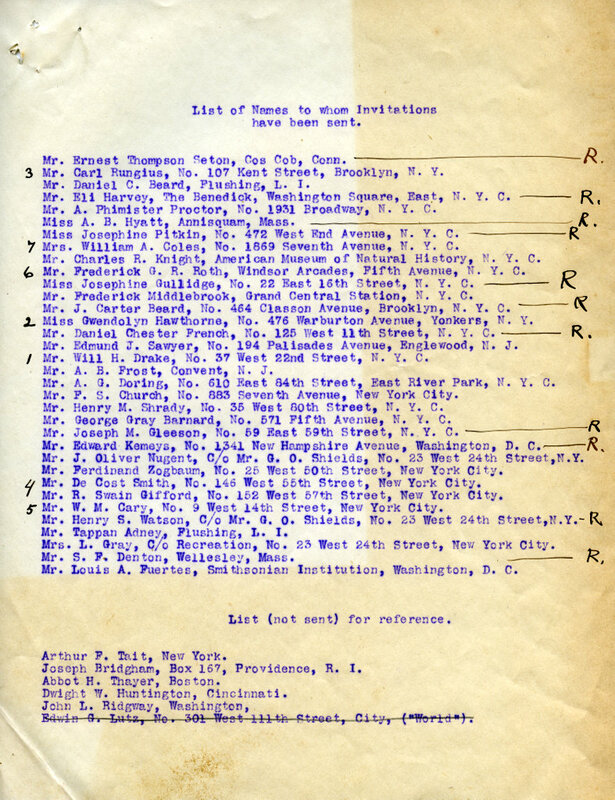 The Society’s first annual report, in 1896, included a proposal from the popular wildlife illustrator Ernest Thompson Seton, who set forth the need for accommodations for artists in zoological parks. This need, he noted, was not met in any existing American zoo nor even in any European one. As Seton argued, while many zoos afforded special spaces and privileges to those studying zoology, animals artists of the era—who also flocked to zoos to observe living animals they could not otherwise see—were treated no better than the average visitor, beholden to regular operating hours and forced to contend with the “nuisance of the weather, and the still greater nuisance of the public.” Indeed, contra the Tribune’s sensationalizing, by several accounts of animal artists working in zoos at the time, it wasn’t the “wild beasts” they feared as much as the crowds of visitors disturbing their work. Postcard featuring Bronx Zoo’s Lion House, circa 1906. WCS Archives Collection 2016. It was to meet these needs that the Society constructed the artists’ studio in the Lion House. 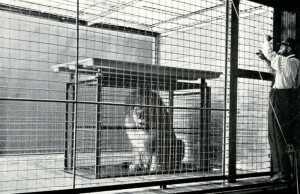 Located in the northeast corner of the building, the studio included two spaces: one room for lockers and supplies; and a second room, approximately 21 by 26 feet, containing a workspace and a large wire-fronted enclosure into which animals were transferred by means of a shift cage, which ran on tracks underneath the flooring of the Lion House. William T. Hornaday, the Bronx Zoo’s first director, took great care in the studio’s design, and he convened a group of artists—composed of Daniel C. Beard, Eli Harvey, A. P. Proctor, and Carl Rungius—to offer recommendations. 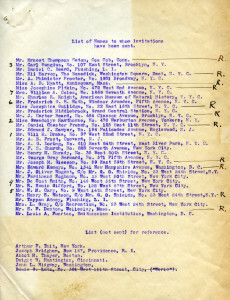 List of invitees to the Lion House Artists’ Studio Opening, 1903. WCS Archives Collection 1001. Upon its opening, the studio became “eagerly utilized” according to then-Vice President of NYZS Henry Fairfield Osborn. The Society’s Annual Report for 1903 confirmed that a “large number of animal painters and sculptors have taken advantage of the facilities afforded to them” in the Zoo at large and especially in the studio. 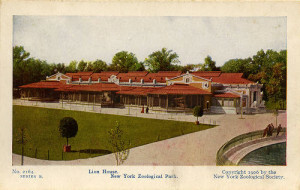 In addition to those who counseled Hornaday on the studio’s design, other prominent animal artists known to have worked in the Zoo in its early years were Anna Hyatt Huntington, George Grey Barnard, Gutzon Borglum, Paul Bransom, Charles Livingston Bull, Avard Fairbanks, Paul Herzel, Charles R. Knight, Frederick G. R. Roth, Eugenie Shonnard, and Katharine Lane Weems. Shift cage in the Artists’ Studio, photographed by E. R. Sanborn. Image published in Zoological Society Bulletin, July 1903. In the end, however, the studio was not the success the Society hoped it would be. Although several artists worked there, the studio’s limited lighting and the promise of fresh air and greater variety of animal life drew artists back out into the Zoo at large. By 1912, Fairbanks noted that the studio was really only used during inclement weather. In the mid-1940s, the studio was transformed into the Zoo’s first Animal Nursery. Today, the Lion House serves as the Bronx Zoo’s Madagascar! exhibit. While the studio itself may not exist anymore, signs of the Society’s history with artists appear throughout WCS’s parks—to be discussed in the next Wild Things post! I also don’t like the public crowded around me when I draw or paint. I wish that I could have seen that unique room in the old lion house.